My doctors over the years have advised me to take a probiotic for digestive health since I'm not a fan of yogurt. I have been on the fence if they truly work or not. 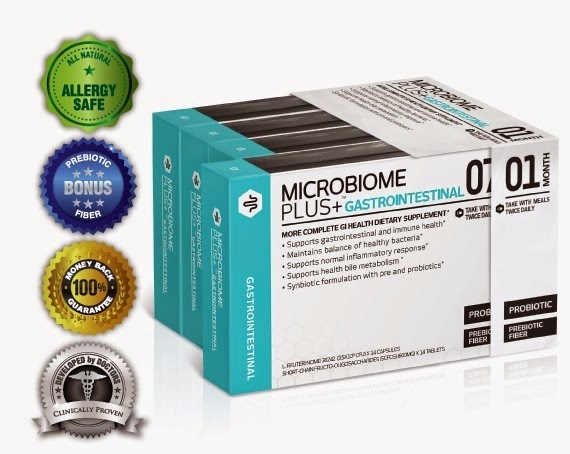 I was given the chance to try out Microbiome Plus+ GI. This product is different in that it you get both 600 mg of a natural prebiotic fiber and 3.5 Billion CFU of probiotic. The two work together to maintain the balance of healthy bacteria in your gut and support your digestion. So what does that all mean? These two work to relieve bloating, gas and constipation and put back the good bacteria that keep your digestive system working properly. It also controls candida and prevents overgrowth of yeast. This has been developed by doctors and it's allergy safe. I will say that since I have been taking Microbiome Plus+ GI I have noticed a difference. I feel a lot better. I didn't realize I had an issue with digestion until I started taking this. I will continue to take this and recommend this as well. One lucky winner will have the opportunity to try this product for free.